Tori James looks back at a team of adventurers who attempted to become the first to paddle the length of the highest river in the world – the notorious Dudh Kosi of Everest. This is a preview of the award-winning documentary about Tori’s record-breaking challenge Beeline Britain. Filmed and directed by Ian Burton of Image Impossible. In celebration of the 60th anniversary of the first ascent of Mount Everest Channel 4 News interview Tori about what it’s really like up there. Tori’s first book Peak Performance is part of the popular Quick Reads series. In this video she talks about some of her inspiration. Published in January 2013. Sitting on top of the world was produced and edited by Matt Callanan Productions as a Getty Images competition entry. Watch Tori’s showreel to witness life on Everest, life on frozen sea-ice as well as her determination and her love of adventure in cold places. It just begs the question, what’s next? An edited version of the BBC2 television programme “On top of the Word” which tells the story of Tori’s climb to the summit of Mount Everest. First broadcast in May 2008. Tori shares her experiences of Everest with an audience at the Unicorn Theatre. Watch this clip for a snippet of the challenges she faced on Everest, from the Khumbu icefall to the extreme cold on summit day. Would she do it again? A 4-minute clip featuring footage from the London Business School Rock & Mountain Club expedition to the world’s sixth highest mountain, Cho Oyu (8,201 metres) in the Himalaya. 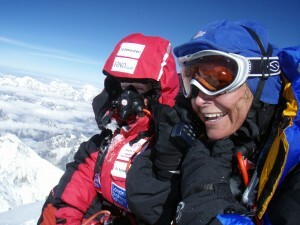 Tori James reached the summit on 2nd October 2006. Modern Spirits London saw the launch of the BMW 5 Series Gran Turismo in London. Author Tony Hawks entertained an audience at the Roundhouse in Camden with an eclectic mix of panelists; adventurer Tori James, world famous composer Steve Sidwell, Michelin-starred chef Jason Atherton and the designer of the new car, Christopher Weil.